As of October 2018, 2011 Amazon launched a new version of the Echo Dot Show. Our Ultimate Guide To Amazon has been updated to include a review of the New Echo Dot Show 2. Whats new with the new Echo Dot? Check our Ultimate Guide to see whats changed. 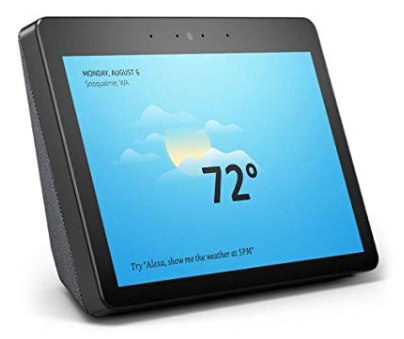 The Echo show was the fourth installment in the Alexa lineup. The speakers are respectable. They sound better than the ones that come standard with the Spot or Dot, but they are front facing. That means that you won’t get the 360-degree sound that is available with the cylinder-shaped Echos. It also doesn’t come with an aux out port. That might be a problem if you want to connect it to something like a Sonos 3 that doesn't have an aux-in port but not a problem if you want to connect it to most Bluetooth enabled speakers. It comes equipped with a 7-inch screen that adds a handful of nifty features not available with its speaker only cousins. First, it allows for natural hands-free video calling. At first, this didn’t sound like such a big deal to me because most people I know don’t own an Echo Show (or the miniature version of the Show, the Echo Spot). Then I realized that you could video chat with anyone that has the Alexa app on their smartphone. That makes this feature instantly more useful. It also has a drop-in feature that allows you to open a video chat with someone who has given you access without them even having to answer. It just instantly opens up. While this might not sound appealing to some people, for others who have elderly parents or disabled friends and relatives, this is a welcomed and even exciting benefit of the Show. Second, you can pull up videos. This is kind of cool, but you probably won’t use that feature as much as you might think. The screen, while respectable is not much bigger than a plus-sized phone. Watching a full movie would be more enjoyable on a larger tablet. The videos do come in handy when you are trying to do something like pull up a recipe. There is a handful of skills like the all recipes skill that will allow you to follow along visually with the chef. Third, you can use it to take a look at your Ring front doorbell camera or through Nest cams at any time you choose if you have these optional accessories. Pretty cool! Those are the main features. You can also use it as a digital picture frame that cycles through your photos, or you can pull up a list of movies showing in your local area, and you can watch the trailer right from the screen. The one killer feature for me is the ability to scan barcodes right from the front-facing camera and purchase it from Amazon. If I’m going to run out of olive oil I scan it and Boom; I can order it straight away and don’t have to remember it later.